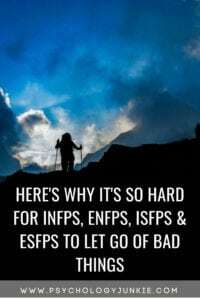 If you’re an ESFP, ISFP, ENFP, or INFP type, then you probably know how hard it can be to let go and move on when bad things happen to you. This is especially true when the “things” involve other people and how they respond to you. All the FP types in the Myers-Briggs® system make decisions using a cognitive function called Introverted Feeling. Personality Hacker nicknames it “Authenticity” because types who use this function care deeply about staying true to themselves. Whereas FJ types place a high value on external harmony, FP types are more concerned with harmony on the inside. FP types build values and process emotions with the introverted sides of their personalities. They’re not usually comfortable expressing their emotional side to the rest of the world, but FP types feel things incredibly deeply. That gives them a valuable and unique perspective on the world, but it can also lead to deep heartache when something bad happens to them. An ESFP who expresses their authentic fun-loving side, then is deeply hurt when people assume that’s all there is to their personality. An ISFP who cares deeply about others and tries to help them, then finds out the people around them misinterpreted their motivations. An ENFP who wants to live life on their own terms by their own values, then feels the need to fake “normalcy” to maintain their friendships. An INFP who shares their deepest emotions with a friend, then receives a shallow or insincere response instead of understanding and sympathy. Many FP types have no trouble stepping into another person’s “shoes.” They easily recognize how other people are feeling, sometimes even before the other person understands their own emotions. 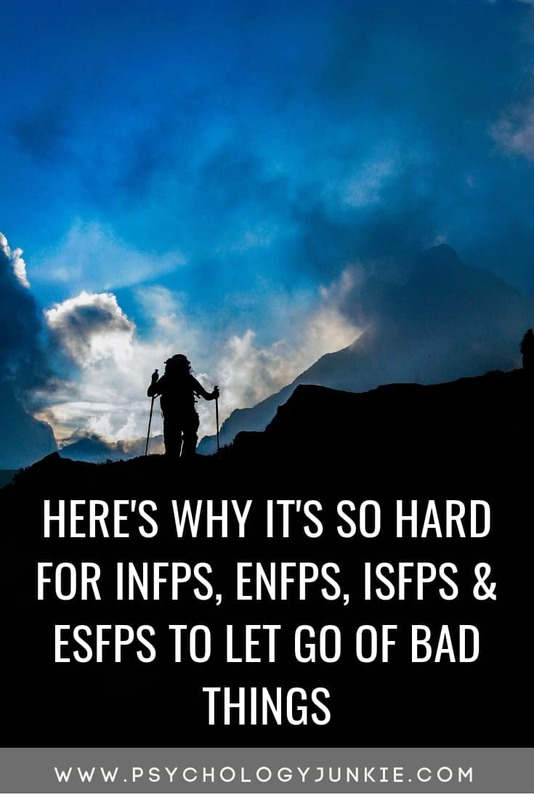 It’s easy for them to take on the other’s perspective, and when that perspective is one that hurts and/or doesn’t respect an INFP’s deeply held values and convictions it can be hard for them to let go of the resulting hurt. So what do you do as an FP personality when something bad happens and you just can’t seem to let go? First, know that you’re not the only one. This is something that anyone, especially types who use Feeling as their decision-making process, can struggle with. Internalizing people’s unkind words, overthinking how a conversation could have gone better, or hating conflict more than another person doesn’t mean there’s something wrong with you. It just means you’re a perfectly normal Feeling type who’s hardwired to care deeply about your own emotions, other people, and social interactions. Knowing that there isn’t something wrong with you can help you accept this side of your personality. It’s just part of who you are. And this acceptance might just give you the freedom to start letting go of hurts that touched the beautiful, authentic core of your personality. I’m an INFJ, not an FP type, but I can sympathize with the temptation to hold onto and stew over bad things that have happened to you. It’s hard, but deciding to let go of those hurts can be profoundly liberating. You don’t need to feel “less than” or get angry if your authentic self doesn’t come across perfectly to other people. Journal your feelings. Many FPs find emotional relief from describing how they feel in writing. If you are dealing with heartbreak or grief, take a break from your normal responsibilities for a day or two to process what you are going through and rest. Listen to music that you identify with. Don’t forget to take care of your physical needs! It can be easy during stages of stress to lose sight of what your body needs. Make sure you are sleeping enough, eating enough, and drinking enough water. Take note of the people who genuinely care for you. After you’ve had some time alone it can be helpful to confide in them and get some support. 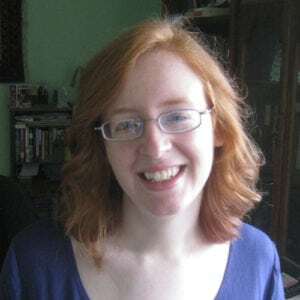 This post is a follow-up to one I wrote a couple weeks ago titled “Why INFJs, ISFJs, ENFJs and ESFJs Struggle to Let Go of Bad Things.” According to the comments, that’s not just a thing that affects FJ types, which prompted me to take a look at things from the perspective of FP types. Your Introverted Feeling side is what makes it hard to let go of things that wound your core, authentic self. But this aspect of your personality is also the part that lets you connect with people in powerful ways. I hope you’ll try to embrace your Feeling side as a gift rather than fighting it or beating yourself up over how hard it is to let go when something hurts you. It’s okay to feel things deeply. What do you find the most challenging about being an FP type? And what do you love about your Feeling side? Let us know in the comments section! Thank you Marisa. Well written and insightful. Helps me to understand how the FP’S relate. Can you give us examples of how the infp’s mirror others feelings? I’m not sure if I know what that means. The hardest gig for me as an INFP is to not get lost in looking at all sides of an issue. Sometimes there is so much gray area to people, places, and things that I can lose sight of what is actually best for me. I hear you! I think for NF types this can be a real struggle! I have always realized that I feel so deeply for people that it can be a gift, or can also destroy me. Taking on their feelings is hard as times, but I believe needed in this world. Your information and advice and letting that go makes a lot of sense. Sometimes I struggle to turn off long enough to relax and get my mind on other things, but I know very well that it brings healing.